The worst drinks of all time? Thread: The worst drinks of all time? Some of these don't sound too bad to me, at least none of them are as bad as a warm Singha. I'm going to try the D-bomb tonight. Bad drinks are easy to find, but truly memorable disasters are few and far between. Here are cocktails that go beyond “poorly conceived” and cross squarely over into Hindenburg territory. Utilizing a combination of bad planning and wildly misplaced enthusiasm, we concocted each of these 10 drinks to single out a particular folly of modern bartending and crucify it with tiny little cocktail umbrellas. Mix with caution. Sangr&#237;a: the refreshing summer drink with the mysterious nonsense name. But it’s a beverage with a fatal flaw. That’s right—the terrible wine. Why serve a bottle of plonk concealed by low-rent soda pop when you can trade up to something they’ll remember … say, a 1975 Chateau d’Yquem accentuated by Orange Fanta, or a 1984 Chateau Mouton-Rothschild Bordeaux complemented by Grape Fanta? Now that’s class! Note to New York, Tokyo, Moscow, and London club owners: This drink can quite easily be marked up to $900 a glass without raising an eyebrow. Spoon mixture into durian halves, each garnished with a gently used sock (recipe makes two sizable drinks). Looking to step up the visual impact of your next Pacific-themed grilling party? Tap into the power of the biggest, baddest tropical fruit under the sun. The sock garnish helps to moderate the drink’s odor without in any way conflicting with the earth undertones of Abe Vigoda and capital punishment that make durian such an adventure. Switch up to pantyhose to set a classier tone, or dress the drink down with a sweat sock that has survived a grueling neighborhood game of b-ball! 1. Mix your alcohol and juices, and heat them on the stovetop—but only briefly. You want the liquid warm but not actually on fire. 2. Take your power drill and a reasonably sized bit (try a 62-gauge), and drill out all 20 of the grapes. Discard the interior meat. 3. Oh, you weren’t supposed to drill all the way through them. You just want to make them into tiny cups. Get 20 more grapes. Try again. 4. You’ll probably want to reheat the alcohol again. Watch that burner! 5. Use the ikebana stand to keep all the grapes upright, and then use the eyedropper to fill each grape with several drops of warmed alcohol mixture. 7. OK, now light all of the grapes with the lighter or matches so that they turn into tiny little drinkable torches. 8. If the grapes aren’t catching fire, the alcohol’s probably cooled down too much. 9. If all else fails, a cr&#232;me br&#251;l&#233;e torch can generally set 40 to 50 percent of the grapes alight while destroying the remainder. Not pretty, but it works. 10. Et voil&#224;! You’ve got a provocative drinkatizer that’ll enchant and delight. Assuming you’re able to move it out into the living room without spilling it or setting small fires. 11. Actually, it’s probably best to set this thing up wherever you’re serving it. Pour vodka into a martini glass and place the Spam cube in it. Garnish with bacon and caviar. No carbs here. The delightful snap of Spam helps offset the salty chewiness of the bacon. The 4 ounces of vodka help you forget that you decided to order a meat-based drink. Mix maple syrup and vodka, and pour into a martini glass. Place fried quail egg on toast round and float on the vodka. Garnish with bacon stir stick. You’ve worked the cocktail circuit. You’ve been to the parties. You know how it goes: Some people just aren’t happy unless a drink has multiple layers. And other people demand a miniature fried egg on a floating island of toast. 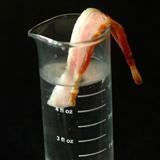 Now you can please ‘em all with the Bed & Breakfast, the layered bacon and floating-quail-egg drink. It’s like a fall day in Maine without all the gruffly inscrutable locals! Divide all ingredients between two highball glasses. We’ve got a post-9/11 attitude (weary confusion), national pastime (standing around at airports), and flag (the Tom Ridge Rainbow of Fear), but we still don’t have a drink. Well, buck up, America—things have turned around. Bust out a pair of highball glasses and get ready to celebrate our nation with this somber yet sassy mix of red, white, and blue ingredients graced by a reflective touch of bitters. And never forget … to add a twist of lime. Blend all ingredients and garnish with a salmon head. If anyone at the party starts talking about the importance of omega-3 fatty acids, merely gesture at your drink and say, “Eh? Eh? That enough for ya?” Later in the evening, give your salmon head a name and have it deliver monologues on the commercialization of independent cinema or why the French Laundry is past its prime. Finally: a drink that combines all the Sunday elegance of the Kir Royale with the extreme-sport energy of Mountain Dew. Drop two pomegranate quarters into a brandy snifter, fill halfway with pomegranate juice, and top off with vodka. Perch the other two quarters on the rim as garnish. Hand to the first person who starts extolling the virtues of “pom.” Charge $16.50. Heat and serve in a glass mug with the rim “sugared” with Splenda. To be drunk by oneself, or in the company of Fabio. James Norton is the founding editor of Flak Magazine and the author of Saving General Washington. He lives in Minneapolis with his wife, Becca Dilley, and writes about food for publications including Salon and Minnesota Monthly. open a hole in the coconut, fill it up with whisky. Shake, drink using a straw. Reminds me of my Peace Corps days. Tiny island. No water. No power. No vehicles. No booze except for our "snake bite medicine" which came delivered in locked plywood boxes. No mixer and no ice, so that's what we did. Open coconut, squeeze in some lime, add booze and you're set for the day. Thanks DrBob, those drinks are just the incentive i need to stop drinking. Nothing could possibly be worse than what I had last night, and don't bet 1000 bht a game on pool when you are pissed. Some are worse than others!!! You've never had Chang Draught then. i fforgot this one, don't know what its callrd though. clear aniseed tasting nasty stuff with gold fleks in it! Fanta red and green are equally disgusting. Aftershock is quite bad, anything with aniseed or liquorice flavour as well. clear aniseed tasting nasty stuff with gold fleks in it! Truely awful! is that not goldmeister or jagermeister? something like that? I onced mixed milk with orange concentrate......not a pleasant experience. I'm going to try the D-bomb tonight. 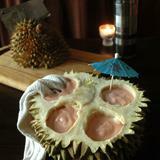 Subject: Durian (fruit) and alcohol? 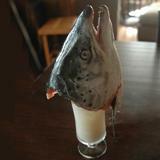 I found the salmon headded-thing most amuzing. My wife might enjoy that one.